I know, I know. Fall has, technically, already begun. But it's only beginning to feel like autumn here in the Mid-Atlantic. I, for one, enjoy the season and all it has to offer -- Denim, comfy sweaters, sturdy boots, apple picking and the smell of pumpkin spice candles burning at home. For me, it's also tough to wear skirts and dresses during the winter, because it's just too cold, even with tights. So, I feel like fall is the last chance at looking somewhat stylish before Old Man Winter blows in and the sun goes down before the end of the work day is complete. The A-Line Dress : Named for its A shaped flare, this shape is flattering for all body types and can be worn with bare legs or tights to equal effect. Wool Knits : Think chunky sweater fabrics and muted shades in a sweater dress, cape scarf, knit leggings or just a traditional pullover, cozy is the name of the game. The Vest : Switch out your blazer for one of these tailored vests. Perfect over trousers, buttoned up or belted, you can even layer one under your winter coat. Slouchy Wide Leg pant : I struggle with this look, because whenever I attempt, it comes off looking messy and unkempt. If you can rock it, pair with an roomy sweater, or highlight your waist by tucking in a blouse. Thigh Slit : Out with the crop tops and in with the thigh-high slit! Highlight those gams with a bold slit skirt or dress. Robe Coats: They look just as they sound and come in a variety of colors and materials. I just purchased an emerald green lightweight coat in this style that I'm excited to wear! I have my eye on this one. Sneakers: My feet are rejoicing in this news, as they will (hopefully) get a little break from heels. 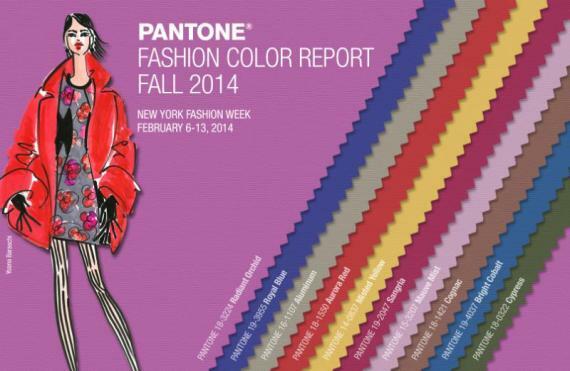 Colors for 2014 fall/winter include: royal blue, red, grey, sangria and cypress (i.e. emerald green). Click here to see all of the hues.